Just as in the wider Magimundi, the tradition of formal dueling is very popular among wizarding youths. Duelists must go through the proper process of bowing to one another, and taking turns casting and defending against spells. Any repeated spell is grounds for a loss, and an emphasis is placed on style and creativity. At P2A4, dueling has a long history, and the champion duelists wear special signet rings. Anyone may challenge a champion for their ring at any time (other than during class), and the stakes of who wears a ring are often treated as life and death. 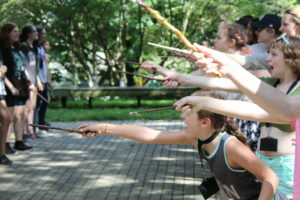 A form of dueling that emerged in parallel in wizarding cultures around the world, the Oldest Game purportedly dates back to the days before magic was performed using wands or even specific spells. It appears in many myths and folktales worldwide, even among mundanes. It is a game of mental transformation and transfiguration, of pure creativity and thought. The players take turns changing themselves into new forms, with each successive form being something that outdoes the opponent’s form. If the first caster becomes a mouse, quick-scurrying, cheese-eating, then their opponent might become a hawk, swift-winged, mouse-eating; the mouse now becomes an arrow, bow-loosed, hawk-slaying. Just as in wand dueling, any repetition of a prior form is grounds for a loss. Irrelevance is also grounds for loss–skipping straight to a black hole, all-consuming, is both poor form and uncreative. Due to this being a fairly subjective rule, the Oldest Game is traditionally played with a third party serving as referee. There is not a formal organization hosting Oldest Game competitions, but it is often used as a way to settle disputes, and is part of the Court Tournament at the end of the week. Fireball dragon is basically an advanced form of the classic dodgeball game. In a tournament two rounds of 10 minutes each are played, with teams switching place on the playing field between games to eliminate any advantages offered by an uneven playing field. In School Fireball Dragon, the fireballs are not actually on fire – but they’re still treated as if they are. The objective of the game is to eliminate the opposing team while gaining and retaining control of the dragon eggs. Each team starts the game in possession of one egg and one fireball. At the start of the game one of the team members is designated as the spirit guardian. The spirit guardian starts the game in their teams limbo zone, while the remaining players start in their teams nest area. A game lasts until one side has lost all players to “injury” or 10 minutes have passed, whichever comes first. 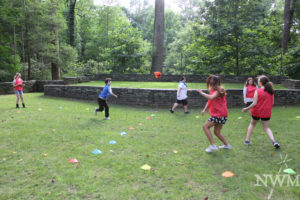 Similar to the classic mundane game of Capture the Flag, the game is played in teams of 4 or 5, comprised of one gaoler (jailer, goalie), and 3-4 thieves. The ground is divided into two equal parts with a small goal marked off at the rear of each part in which six wands are placed. Each player who reaches the enemy’s goal may carry one wa back to his own goal, but can still be caught by the opposing team. If the stick is cursed, then the player carrying the stick is under one of five effects (see below). Each Curse is signified by a coloured ribbon. If caught in the enemy’s territory a player must remain a prisoner in the goal until touched by one of his own side; neither may be caught while returning. Any player may catch any opponent except under the rules just stated. No stick may be taken by a side while any of its players are prisoners. The game is won by one side gaining all of the sticks. Fuego Curse: (red) The person who picks up the stick can only move for 10 steps with it then they must drop it. They can pick it up again, but they can only move 10 steps. Infringa Curse (blue): The person who picks up the stick can only move at a walk. Gaia’s Curse (green): The person who picks up the stick can only move 5 steps then are rooted in place by greenery. The can’t go to jail, but they require 2 teammates to touch them to end the curse and be able to move again. Aero Curse (yellow): The person who picks up the stick cannot move in a straight line until they either put the stick down or reach their side. Mortis Curse (black): The person can make it back to their side with no effects, but is removed from the game once they cross to their side (yes it means you are down a teammate for the rest of the game).